Travel today to our nations capital, Washington, D.C., and spend a delightful afternoon with the cast of The Bands Visit at The John F. Kennedy Center for the Performing Arts. This critically acclaimed new musical celebrates the deeply human ways music, longing, and laughter can connect us all. After a mix-up at the border, an Egyptian Police Band is sent to a remote village in the middle of the Israeli desert. With no bus until morning and no hotel in sight, the locals take in these unlikely travelers. Under the spell of the desert sky, their lives become intertwined in the most unexpected ways. The Bands Visit is the winner of 10 Tony Awards, including Best Musical! The Bands Visit is The Best Musical on Broadway! Beautiful music, beautiful story, beautiful acting declares The Washington Post. Note: The Bands Visit is recommended for ages 12 and older. Before the show enjoy a delicious lunch at Saints Paradise Cafeteria, a southern and soul restaurant where love is the main ingredient. 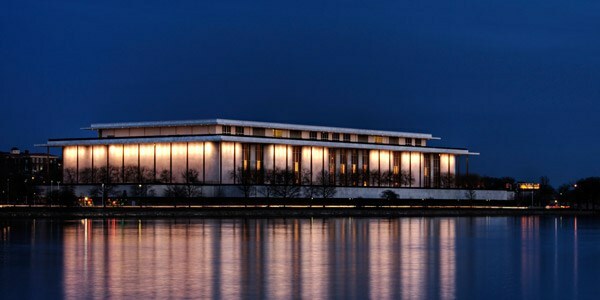 The Bands Visit is presented in the Kennedy Centers Eisenhower Theater with Center Balcony Seats. Showtime at 2:00 P.M.